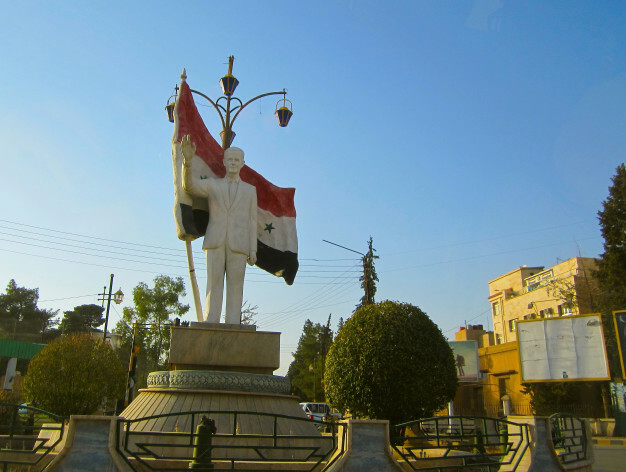 A statue of Syrian President Bashar Assad still stands in Qamishli town. Credit: Karlos Zurutuza/IPS. QAMISHLI, Syria , Oct 31 2013 (IPS) - “The whole region is under control but be careful in the city centre,” says a Kurdish militiaman at the eastern gate of Qamishli, 600 km northeast of capital Damascus, confirming rumours about breaches in Syria’s relatively stable northeast. Sandwiched between Turkey and Syria, this city of 200,000 is known for its large Christian processions at Easter, held almost simultaneously with the mass celebration of Newroz, the Kurdish and Persian new year. Qamishli is not only a melting pot of Assyrians, Armenians, Kurds and Arabs but also the place where the Syrian Kurd uprising had its origins. It was March 2004 when rioting after a football match in Qamishli led to days of dissident protests in the Kurdish regions, as well as in Damascus and other cities with a significant Kurdish population. Since the beginning of civil unrest in Syria in March 2011, its Kurds have vowed to take the “third way” – allying neither with Syrian President Bashar Al-Assad nor with the insurgents. They took over areas in Syria’s northeast, where they are concentrated, in July 2012 but have been constantly involved in clashes with both sides as well as Islamist groups linked to al-Qaeda. Today Kurdish flags are almost ubiquitous in their region, but not in Qamishli’s city centre, where Assad's forces still hold sway and keep a tight grip on the airport. Today Kurdish flags are almost ubiquitous in their region, but not in Qamishli’s city centre, where Assad’s forces still hold sway and keep a tight grip on the airport. A daily flight still connects Qamishli with the country’s troubled capital. “There are 600 km between Qamishli and Damascus but overland journeys are no longer an option,” Hamid, a local gas trader, tells IPS at his shop. Little wonder that local people have dusted off their bikes. The price of basic goods may not have gone up as dramatically, but most Qamishli residents are struggling to survive. One day a window blind remains shut, or the mail does not arrive, or the examination results don’t come…all signs that yet another family is fleeing to join the ranks of 200,000 refugees in the Iraqi Kurdistan Region, languishing in five refugee camps or in thousands of packed, shared flats. Power cuts are constant, water supplies scarce and mobile phone communications are only available due to the proximity of Turkey. Virtually every Syrian alongside the northern border is a subscriber of one of the main Turkish telephone companies. Hozan writes in his native Kurdish for a local newspaper. As a kid, his father taught him to write in a language that was banned under Assad’s rule. The parallel revolution of the Kurds has also brought in Kurdish schools, community centres for women and effective administrative management, from the military to garbage collection, even if the garbage is sometimes burnt in the bed of the Jaghjaghah, the river which dissects the city from north to south. Such order amid the chaos posed by war comes from the hands of countless volunteers such as those led by Hashim Mohamed, head of the Asayish, the Kurdish police. This former PKK fighter tells IPS that he has 4,000 men under his command and he even admits to a few cases of ill-treatment suffered by prisoners. The existence of a government-run checkpoint just a few metres away fuels rumours of a secret truce between the PYD, the dominant party among Syrian Kurds, and President Bashar Assad. Senior PYD representatives have repeatedly denied such claims to IPS and the police chief commander follows suit. “They do not come into our area and we don’t go into theirs. We simply ignore each other,” says Hashim Mohamed. True or not, Bashar Assad still smiles from a big billboard at Qamishli’s post office. A few metres away stands a statue of Assad holding a Syrian flag. At his feet, militiamen dressed in black jump into the back of an armed 4X4 van. Were it not for the Syrian flag painted all over the vehicle’s body, one might have taken them for insurgents fighting the regime. “Those are sabihas, civilians paid and armed by the regime at the beginning of the uprising,” says Edmon, a local Assyrian Christian activist siding with the opposition. “Do not talk, do not look at them and hide your camera,” he advises. While there is no permanent checkpoint, a random search could spell trouble for this IPS reporter in this part of the country with the consent of the Kurds, not of Damascus. Leaving behind the main square, the once ubiquitous portraits of the Assad saga are no longer visible in store fronts, restaurants and windshields, but neither are the Kurdish flags. However, traffic policemen rest in cabins painted in the red, black and white colours of the Syrian flag. Bazaar stalls are busy and local sweets made of honey and almonds are still popular in Qamishli’s many cake shops. “The owner of that one is the brother of a well known opponent of the regime in Aleppo,” says Edmon, who “deeply” laments the divisions the crisis has created for Syria’s Assyrian community. I am in awe reading this article about how the Kurds are dealing with all the bombing going on and having to deal with the criminal behavior of Assad and his regime on one hand, six different terrorist cells on the other hand, and then we have the FSA, the recognized voice of Syria. I recall reading an article about there being threatening behavior towards the Kurds. I realize and sympathize your situation, but feel you are in the right to take the action you have for your people. Please know that I have been praying for the Syrian people to have peace once again and be able to lead normal lives. I have a feeling though that this will be a long (vs short) time coming. But I have faith in my God that He will make way all that is necessary to meet your needs. God bless!